It is time again to share my latest adventures in Napa Valley with you. What follows is a day-by-day accounting of my trip west. After this I will be posting individual articles on some of the more notable events. Mrs. Tiedemann and I arrived in Chicago on Friday afternoon…it was later than we had hoped due to some extra work I had at the office. I think she was a little disappointed in the late start. It was good to be back at our place in Chicago. We haven’t been there since early December when grandson Adler Bear had to go to Ann & Robert H. Lurie Children’s Hospital for his quarterly MRI and check-up. Friday evening Mrs. Tiedemann and I headed to Hugo’s Frog Bar & Fish House. It is part of the Gibson Restaurant (Steakhouse) Group. It is one of our go-to places for fish entrees. Both of us ordered the miso-marinated Chilean sea bass. Sea bass is one of our favorites. For wine I chose the 2013 CADE Estate Sauvignon Blanc by PlumpJack. Our friend Dannielle Cyrot (Devlin) is the winemaker at CADE Estate Winery in Napa. The wine paired wonderfully with the fish. Hugo’s has a good wine list with plenty of depth and the prices are reasonable. Saturday was a busy day. We had brunch at one of our favorite Chicago spots: Luxbar at 18 East Bellevue (312-642-3400). We had the chance to catch up with Michael Avella, the General Manager. Michael is a nice guy and a proud new father. It was fun to get the stats on his 6-month-old son. Luxbar only serves breakfast/brunch on Saturday and Sunday mornings and they are always busy so it is wise to call ahead for reservations. After a busy afternoon we had a quick glass of wine and coffee back at the apartment before we headed to the Capital Grille for dinner. The Capital Grille (603 North St. Clair, 312-337-9400) is a good steakhouse and you can depend on their steaks and the service being good. Evan, our waiter, has waited on us before and it was nice to see him again. Overall it was a great finish to a wonderful weekend with Mrs. Tiedemann. We recommend the Capital Grille. 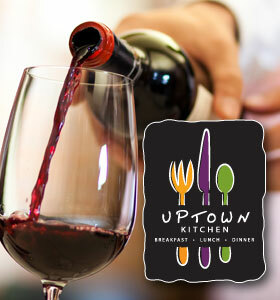 They have a good wine program and their “by the glass” pours offer a good value. I was up early getting ready and packing for the ride to O’Hare. The 10:10 a.m. American Airlines flight I always took on Sunday to San Francisco is no longer available so I chose the earlier 8:40 a.m. departure (Flight #AA1435). I was hoping I would miss the Sunday traffic in San Francisco as it can be maddening driving to Napa when the traffic is heavy. Arrived in San Francisco on time and headed for the rental car building on the train. It is such a time-consuming process to get your bag, catch the airport train and get your rental car. Thank goodness the traffic was light on the drive from the airport to Napa. I made good time getting to the Hilton Garden Inn in Napa. As I have mentioned in the past, the Hilton Garden Inn hotel is a good place to stay. 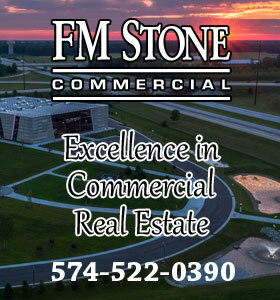 It is well-situated in my opinion, providing easy access to many locations. It is located right on Highway 29, the main artery through the Valley. 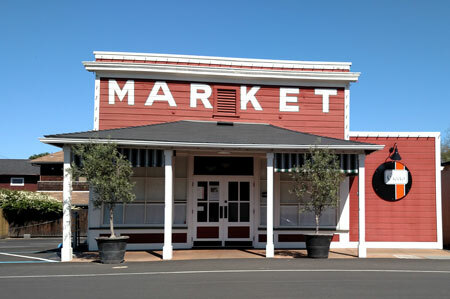 You can easily get to downtown Napa or the Silverado Trail (a scenic route that travels 29 miles along the eastern edge of the Napa Valley, parallel to and several miles to the east of California State Route 29) with little effort. The staff is very friendly and helpful. I haven’t eaten dinner in the restaurant but the breakfast menu is good. The Italian omelet and fruit bar pair nicely. For assistance with reservations call the desk at 707-252-0444. My normal tradition on the day I arrive in Napa: I head to my friend Didier Loustau’s house for dinner, wine and great conversation. It was no different on this trip. After getting situated at the Hilton, I headed for Didier’s and Susan’s house around 5:00 p.m. It was really great to catch up on their activities and what was been going on with the two of them and their ToutSuite Social Club operation. Dinner was delicious as usual. Didier manned the grill, keeping a careful eye on a cut of beef called a tri-tip which I have learned is from the bottom sirloin cut. Susan prepared sage potato galette (thinly sliced potatoes) and roasted broccoli with red onions. For dessert Susan made a rum-flavored chocolate cake. It was very rich but a great finish to the evening’s meal. 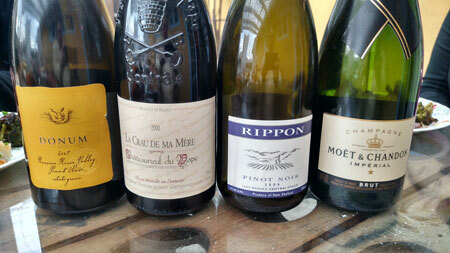 In the wine category we started with some Moët & Chandon champagne and then tried two Pinot Noir wines: a 2007 Donum Estate (Carneros) and a 2006 Rippon (New Zealand). We finished the evening with the wonderful chocolate cake and a 2000 La Crau de Ma Mère Châteauneuf-du-Pape. This dinner and conversation with friends was a great start to a week that promised (and was) to be jam-packed with different activities and opportunities. The morning started off slow (the three-hour time difference can be a killer) but got busy around mid-morning with a stop at Vinoce Winery to try and locate friends Brian and Lori Nuss. 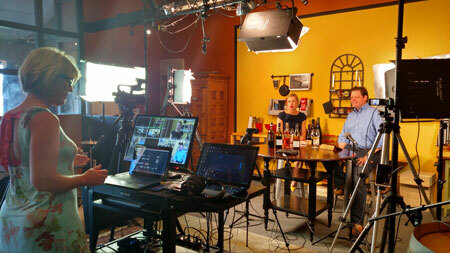 ToutSuite: Courtney Humiston and Scott Barber record the Somm2Somm program. 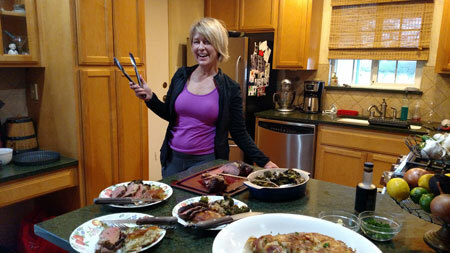 Monday evening’s dinner with Didier and Susan was at Fume Bistro (4050 Byway East, 707-257-1999) in Napa. The evening’s wine was a bottle of 2009 Phipps Family Cellars Zinfandel. The wine was reasonably priced and a good value. Try it if you get the chance. Tuesday was a very exciting and busy day. Some months ago I posted my review of Ramey Wines’ 2004 Jericho Canyon Vineyard Cabernet. I sent a link of the blog posting to Ramey Wines and got a very nice note back from Alexandra O’Gorman, Communications Director of Ramey Wines, saying they appreciated the blog posting and that David Ramey himself wanted to host a tasting of Ramey Wines with me the next time I was back in the area. I quickly accepted. Look for a complete report on the impressive David Ramey, his wines and our tasting in the weeks to come. After leaving Ramey Wines I headed back toward Napa and on the way, made a stop at White Oak Vineyards & Winery. My good friend Tom Pletcher is involved in White Oak wines and Tiedemann Wines is their northern Indiana distributor. I was hoping to meet with Will Hunter, Director of Sales. Unfortunately I missed him by one day as he had left the day before on a sales trip. I did, however, get to see Francesca Huson, the tasting room and events manager there. She, along with Harry Conley, treated me to a great tasting of current released wines as well as the newly bottled White Oak 2007 Napa Valley Port. It was quite tasty. On your next trip to Napa Valley plan a trip to Healdsburg and don’t miss trying a tasting at White Oak. It is easy to get to (on Highway 29). You will need to make an appointment for your tasting and can do so by calling the Winery at 707-433-8429 or emailing the Tasting Room at tastingroom@whiteoakwinery.com. If you get the chance to go there you’ll have a great time. Tuesday evening dinner was back at Didier’s house. 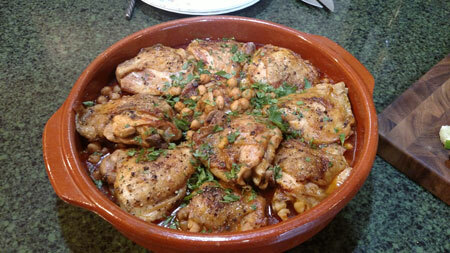 He prepared a lovely chicken Poulet à la harissa façon Didier. 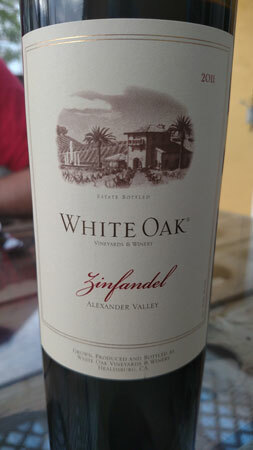 The wine of the evening was 2011 White Oak Zinfandel, Alexander Valley. For dessert we ate baked Swiss cheese with herbs and fresh black pepper sprinkled on it and we drank the 2007 White Oak Port. Wednesday was a slow day. Most of the day was spent catching up on emails, phone calls and other business and organizing and working on blog articles. Around 11 a.m. I had a meeting with T. Mary Beller and Rob Roy. T owns a company called Verve Napa Valley that specializes in customized wine country tours! Susan Quinn introduced me to T and her company so I could learn how tours were structured and conducted. Many of you have asked about going to Napa with me and the meeting was to explore the possibility of a Tiedemann On Wines tour to Napa Valley. You never know what could happen. About 2:00 p.m. I headed to St. Helena to meet up with Sean Larkin of Larkin Wines and winemaker of our Tiedemann Signature Series Red wine. Sean had just returned that day from an east coast trip. It was good to chat with Sean and catch up on all his activities. Ciccio Napa Valley where we dined for dinner on Wednesday. Later that afternoon we met with Kerrin Laz the then wine director for Dean & Deluca. Karrin has since left Dean & Deluca and started her own wine business: K. Laz Wine Collection. I will report more on this new venture in the weeks to come. 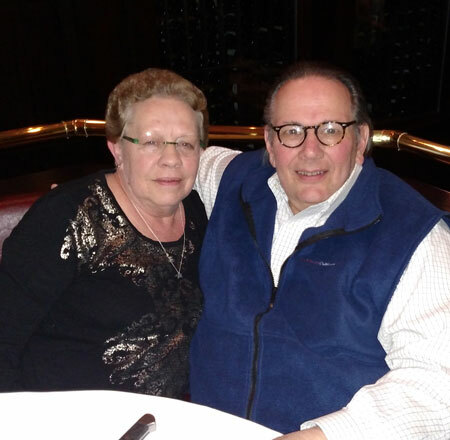 Kerrin was with her friend, 4 Winds Winery owner, Roy D. Chapin IV. His is a new Napa Valley winery just making its first release of Cabernet Sauvignon – more to follow on that later as well. Karrin and Roy joined Sean and I for dinner at Yountville restaurant Ciccio Napa Valley (6770 Washington Street, 707-945-1000). Ciccio is owned by the same family who owns Altamura Vineyards and Winery. This is a local hot spot with great food. Call for reservations…you’ll need them. The food was good and their wine list is adequate. It does include Sean Larkin’s Cabernet Franc which we enjoyed a bottle of. From Somerton I headed back down to the valley floor and had a visit at B Cellars Vineyards and Winery in Oakville. 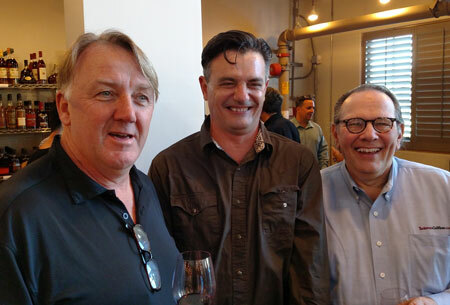 I had the good fortune of meeting Jonathan Ruppert, Director of Operations at B Cellars through Sean Larkin and Jack Edwards, the evening before. At that chance meeting we quickly arranged the winery tour. It was a great tour and tasting which I will give you the details on in a later blog article. They have an interesting tasting program that I want to tell you all about. 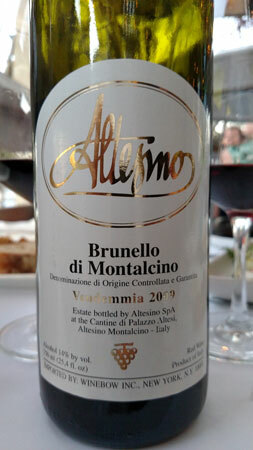 The 2009 Altesino Brunello di Montalcino was a winner. Dinner that evening was with Sean, Didier and Susan. We ate at Bistro Don Giovanni (4110 Howard Lane, 707-224-3300) just off Highway 29 in Napa. The restaurant features great Italian fare with an ample wine list. Our wines of the evening were a 2009 Altesino Brunello di Montalcino and a 2008 Strada al Sasso Chianti Classico Riserva. The Brunello was a winner, although it seemed to be peaking in its flavor profile which is unusual for a Brunello. Halfway through the evening we had the good fortune of Jonathan Ruppert joining our table. Friday was another busy day starting with our wine label designer, Robin Riedel of Riedel Grafik Design. I first met Robin through TAPP Label, our label printer. He has since left TAPP and is continuing to design labels with his own new company. Over the past five years he has designed all of our wine bottle labels and has been very gracious with his advice and guidance in this area. We have agreed to do a video together about the design of wine labels. Stay tuned for that in the future. After lunch I met with Bruce Devlin, Winemaker at Ballentine Vineyards…and of his own wines at Three Clicks wines. Bruce and I met to discuss the making of a new red blend under our Glenwood Cellars label. We tasted some components and agreed for Bruce to move ahead to develop some samples. It looks like a 2014 red blend will be released in 2016. I will keep you up to date on the progress of this special new project. 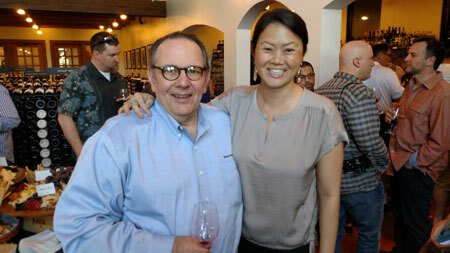 Carl and Kerrin Laz of K. Laz Wine Collection at the Dean & Deluca 2012 Vintage Tasting on Friday. From that tasting it was off to pick up Sean and Didier. We headed to the invitation-only Dean & Deluca 2012 Vintage Tasting with Napa Valley Vintners. The tasting featured 20 high-end Cabernets and was held in the wine shop at Dean & Deluca in St. Helena. Stay tuned for a future rundown on that very special tasting event. After the tasting we all went next door to the Press Restaurant (587 St. Helena Highway, 707-967-0550) for drinks and dinner. 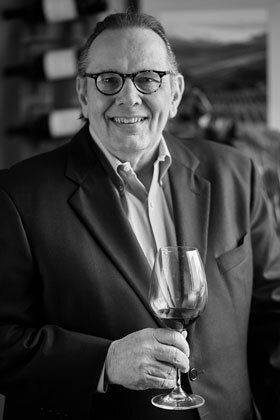 I had the good fortune to chat with Kelly Peterson of the Peterson Family Vineyards. 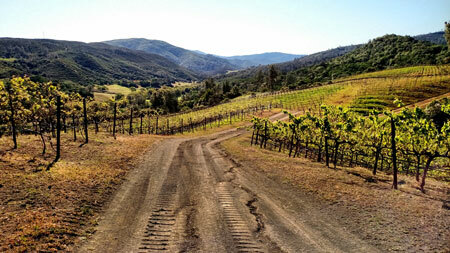 They make the outstanding Switchback Ridge Cabernet. I also got to catch up with Angela Stem, Sommelier at PRESS. I had met Angela on a previous trip to Napa on a ToutSuite Show devoted to the Press Restaurant (see Cork Wars with Press Sommelier Angela Stem link here). She is very knowledgeable on wine and does a great job of assisting the customers at PRESS on their wine needs. Dinner at PRESS was my final Napa event. Goodbyes were said and I headed to the hotel to pack my bags for my trip back to Chicago on Saturday morning. On Saturday morning I caught the American Flight #242 to Chicago and landed at O’Hare around 2:30 p.m. Chicago time. It was nice to get downtown and meet up with Mrs. Tiedemann and catch up on her past week’s activities. Dinner on Saturday evening was at a new restaurant to us: The Boarding House (720 North Wells Street, 312-280-0720). The cauliflower bisque is wonderful and a must have if you go there for dinner. For entrees Mrs. Tiedemann had the mushroom risotto. She said the dish was fair as the mushrooms were overcooked for her liking. I had the scallops which were delicious (and almost as good as Sean Kelly’s at Temper Grille in Granger, Ind). My wine choice to pair with the soup and scallops: the 2013 Complices De Loire, Sauvignon Blanc, Touraine, France. Mrs. Tiedemann and I recommend The Boarding House for one of your Chicago restaurant stops. You’ll want to call several weeks in advance for reservations as the place is busy. On Sunday it was back to Elkhart, along with a touch of the flu, which Mrs. Tiedemann blames on breathing airplane air. She is probably right. This trip to Napa exceeded my expectations. I met some new people and got to catch up with old friends. I also had the good fortune to broaden my wine knowledge (tasting over 60 different wines on this trip)! I spent a lot of time discussing social media channels and opportunities, and the use of videos to connect with people, which you’ll be seeing a lot more of on TiedemannOnWines.com. All in all it was a great trip and I accomplished a lot. But it is nice to be home. Very enjoyable report, Carl. FYI, ground zero for great Tri-tip is the Santa Maria Valley in the Central Coast area. Hello Mark. So nice to hear from you. Hope you are well. It was a great trip and I learned a lot about wine and wine making. I am excited to share it with all of you in the weeks ahead. Thanks for your support. Yo Carlito, I don’t know how you remember all of that…your hands are too busy holding a glass of some sort of alcohol, a fork or a cigar…but never a pen! Hello my friend. I would like to say it is from a brilliant mind but I secretly take a lot of notes when no one is around. Otherwise I wouldn’t be able to remember anything, the cause of which is holding all those items you mentioned. Thanks for your continued support of the wine blog.